Despite the lack of secured funding, the University of South Alabama will break ground on a $72 million, 25,000-seat football stadium this summer. With a unanimous vote Friday, June 1, the University of South Alabama Board of Trustees agreed to move forward with a $72 million on-campus stadium project. The vote to begin site work on the stadium project would mean the Jaguars’ football team could no longer need to use the city-owned Ladd-Peebles Stadium as early as 2020. In the same week, the new owners of the Mobile BayBears officially announced the team’s move to Madison to start the 2020 season. 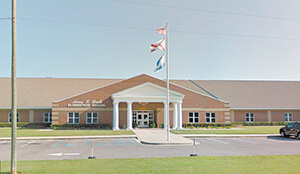 The moves could leave the city with decisions regarding two publicly funded facilities at a time when Mayor Sandy Stimpson is committed to reducing the city’s involvement in these structures. In a statement, Stimpson’s office seems positive about USA’s move. “The city of Mobile was approached by the University of South Alabama to consider participating in a public-private partnership for construction of a new football stadium to be located on the university campus,” city spokesman George Talbot said in a statement. “The city is motivated to help USA achieve its goal and to continue its growth as an economic engine for Mobile. USA Athletic Director Joel Erdmann told a gaggle of reporters outside the school’s boardroom the university would be happy to secure both the Senior Bowl and the Dollar General Bowl in the future. “It would be an honor and a privilege to host them,” he said. As for the trustees’ vote, Erdmann called it a “very positive step forward” for serious discussions that began roughly three years ago. He said the move could have a “ripple effect” for “40, 50, 60 years” and help the school build on a football tradition built 10 seasons ago. In addition to helping build a tradition, Erdmann said an on-campus stadium would enhance student life, as in the future enrollees would be able to walk out of a dorm room and down the street to the stadium. As for a construction timeline, Erdmann said for the university to seriously consider playing on campus in 2020, construction would have to begin in July. The school already benefits from strong infrastructure, which will help construction, he said. When the Jaguars eventually leave Ladd-Peebles, the stadium will still be home to a number of local high school football teams. But the future of Hank Aaron Stadium is less clear. The BayBears’ owner, BallCorps LLC, announced last week the company has received official approval from Minor League Baseball to relocate the team to Madison. Beginning with the 2020 season, the team will play in a new ballpark and multi-use venue being constructed by the city of Madison at the 500-acre Town Madison development. BallCorps had previously received permission for relocation from the Southern League on May 11 in a unanimous vote by the league’s board of directors. The final step in the process is a review of approvals by the office of the commissioner of baseball and the issuance of a “non-objection” letter, anticipated soon. The BayBears have played at the stadium for two decades and the city recently put more public money into it, based on the recommendations of Major League Baseball and the team’s former affiliate, the Arizona Diamondbacks. The city paid to replace nearly 1,000 seats, made drainage improvements and upgraded the public address system at the stadium. The city has been in discussions with organizations not related to Minor League Baseball about use of the stadium, but nothing has been announced.